Bank of America Plaza at Las Olas City Centre (LOCC) is a 23-story state-of-the-art office tower and retail complex in downtown Fort Lauderdale, Florida. To maximize the presence of the building in the Fort Lauderdale skyline and in an effort to lower operating costs, LED Source provided LOCC an LED lighting solution that saved them almost $27,000 annually. Bank of America Plaza at Las Olas City Centre (LOCC) is a 23-story state-of-the-art office tower and retail complex in downtown Fort Lauderdale, Florida. Construction started on the 407-foot building in 2000 and opened in 2003. The fourth tallest building in Fort Lauderdale, LOCC serves world-class office tenants such as UBS Financial, Greenberg Traurig LLP, Patriot National Insurance and the building’s namesake, Bank of America. The complex includes a five-story parking garage as well as a pedestrian-friendly retail plaza located on trendy Las Olas Boulevard. An iconic landmark for the City of Fort Lauderdale, the skyscraper features a 42-foot signature pyramid, or ziggurat, located at the top of the building. 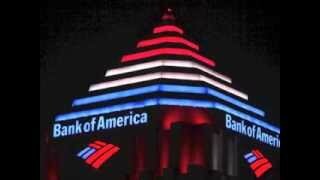 Illuminated at night, Bank of America Plaza at Las Olas City Centre has earned a prominent place in the city’s skyline. Over the years, LOCC has won numerous awards including the prestigious ‘Building of the Year’ for its craftsmanship and architecture. It was also awarded an Energy Star rating for operating efficiency in 2011. Adding to its accolades, the 408,079 square-foot office tower recently achieved LEED® Gold Certification by the U.S. Green Building Council for meeting LEED® standards with a waste-to-energy and recycling program, upgraded lighting system, water conservation, sustainable design features and incorporating a number of ‘green’ initiatives. In helping to receive this certification, the building’s institutional investors advised by JP Morgan Asset Management, along with Stiles Property Management, looked to find ways to reduce energy consumption and lower operating expenses. This included replacing the outdated, energy-wasting conventional exterior lighting fixtures with a new, more efficient LED lighting system. Maintenance on the aging metal halide fixtures also proved to be both expensive and challenging. In addition, the design goal of the retrofit was to illuminate the structure with programmable colored (RGB) LED lighting. This would not only maximize the presence of the building in the Fort Lauderdale skyline, it would complement and enhance the atmosphere of the street level for Las Olas Boulevard’s high-end restaurants and shops. The previous lighting for Bank of America Plaza at Las Olas City Centre consisted of 72 metal halide tubes on the ziggurat, 32 metal halide fixtures on the roof level, 32 metal halide fixtures on the parking garage wall and 8 metal halide fixtures that illuminated floors 3 to 23. Total wattage of the power-hungry outdated lighting was 54,632 watts. To accomplish these goals, the experts from LED Source® worked very closely with Stiles Property Management to develop and design a plan that respected budgets and energy efficiency, while converting the exterior lighting to color-changing LEDs. Prior to installation, a 3D CAD rendering was created for the project that showcased how the building would be lit with the new color-changing LED lighting. This allowed for the client to fully visualize the look from its previous single white color, to a dynamic, almost endless palette with over 16 million possibilities. It also provided the ability to see how LOCC could be used to create a wide variety of artful scenes depicting color schemes for holidays, charities and special occasions, including sporting and local events. To light Bank of America Plaza at Las Olas City Centre as outlined in the design goals for the project, four key areas were identified; the signature 42-foot ziggurat on the top of the building, the rooftop on the 23rd floor, the southeast, southwest and south faces of the building, and the southwest wall of the parking garage. Since each of these areas were unique in their lighting challenges, the design team chose LED lighting fixtures from Philips Color Kinetics. For the ziggurat, 242 ColorGraze Powercore linear LED fixtures were used in 2, 3 and 4 foot lengths. These were mounted to focus all available light on to the ‘steps’ of the ziggurat. Each step is capable of independent color control and is visible for up to 5 miles in the Fort Lauderdale skyline. On the roof level, 32 ColorBlast Powercore LED wash fixtures were installed to illuminate the architectural setbacks on the building. This helped to visually accent the pyramids structure and created a sense of depth. For the parking garage level, 8 ColorReach Powercore Gen2 LED fixtures were used to illuminate the 20 stories of the east, south and west sides of the building. These were a direct one-to-one replacement for the antiquated metal halide fixtures. The cutting-edge exterior LED lighting system not only lowered operating costs, it also improved aesthetics and created a more vibrant illumination for the building. It is estimated that the LED lighting retrofit will save Bank of America Plaza at Las Olas City Centre $15,133 in lighting energy and $11,764 in maintenance. This represents a total annual savings of $26,897. In addition, the building reduced its annual kWh from 179,466 to 41,897, for a total annual energy savings of almost 77%. The annual reduction of greenhouse gas emissions is equivalent to 97.1 metric tons of carbon dioxide. *Due to the nature of RGB LED fixtures, maximum output is achieved in full RGB white. Given that the building will be primarily lit in color, it is estimated that the average power consumption will be running at 70% of maximum.